In commemoration of the tragic sinking of the SS Mendi that took place on 21 February 1917 during World War I, the South African National Defence Force (SANDF) hosted its 4th South African Armed Forces Day exactly 99 years later in the Friendly City. The day was preceded by a series of activities that focused on the community of Nelson Mandela Bay. These included an exhibition of several South African Navy ships that would participate in Armed Forces Day. To the delight of the public, the ships exhibition also included viewing of the SAS Queen Modjadji, a Heroine-class submarine. Other events included community concerts by the various bands of the SANDF, a night shooting demonstration and a military career exhibition at Kings Beach. The week’s activities concluded with Armed Forces Day which entailed a Wreath Laying ceremony at the SS Mendi Memorial in New Brighton; a parade attended by the South African president; a capability demonstration that showcased SA Navy vessels, aircraft of the SA Air Force and the skills of South African soldiers; and a mechanised column of military equipment that “paraded” in the streets of Port Elizabeth. Extensive planning was required to execute the events of the Armed Forces Day and one of the considerations during planning was the environmental impact of these events. The Environmental Services of the SANDF was responsible for the establishment and implementation of sustainable practices during the activities of the Armed Forces Day. Integrated waste management, sustainable resource use, soil conservation and marine and coastal conservation are a few of the areas that were considered. The management of waste to be generated by approximately 4,000 soldiers over a period of 2 weeks as well as the waste to be generated by the public posed an opportunity to Environmental Services to promote recycling as a sustainable practice. Consequently, a partnership with The Waste Trade Company (TWTC) was created to implement recycling during the activities of the Armed Forces Day. 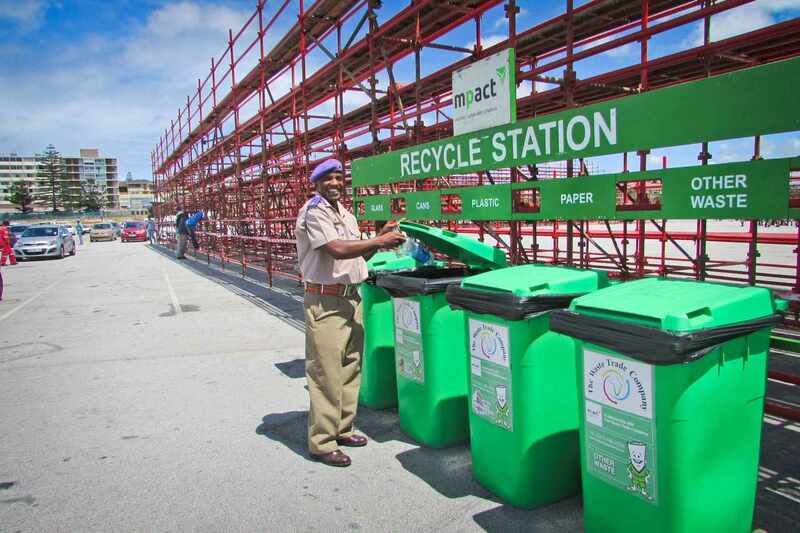 Recycling stations, provided by Mpact SA, were strategically placed at the accommodation sites, as well as the military career exhibition at Kings Beach. The Waste Trade Company's staff attended the events in order to provide recycling guidelines to all who made use of the recycling facilities. TWTC also provided for storage and collection of the recyclable material. Event recycling presents many challenges – the general public are not always disciplined and they lack the knowledge to recycle efficiently. Recycling in South Africa also involves careful logistical planning and intense manual labour. True to form, Port Elizabeth also presented a gale force wind, which meant that bins needed to be placed down to avoid littering. Bags were handed to each military tent at the career exhibition to store their recyclables until the winds died down. Military staff was also seen on the grounds and amongst the dunes, bags in hand, picking up any litter to avoid polluting the ocean. 1213kg of recyclables were collected from all the events leading to and including the South African Armed Forces Day. "There is still much work to be done to encourage SA citizens to recycle efficiently, but once you start recycling, you can't stop...so we aim to change the general mindset, even if it is only one person at a time!" - Vicky du Toit, Marketing Manager, TWTC.